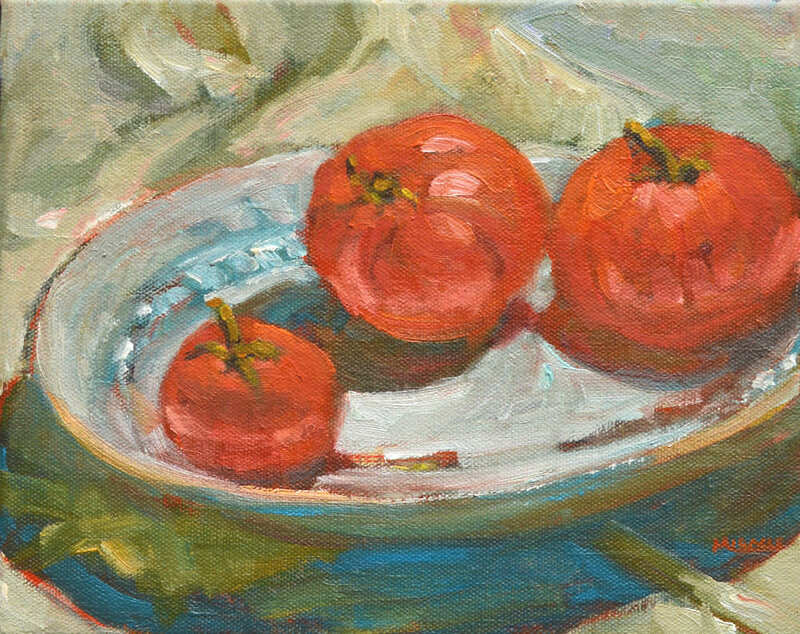 This is the fifth painting in my Lucky Red series. There are many symbols of power and good fortune in this set up. 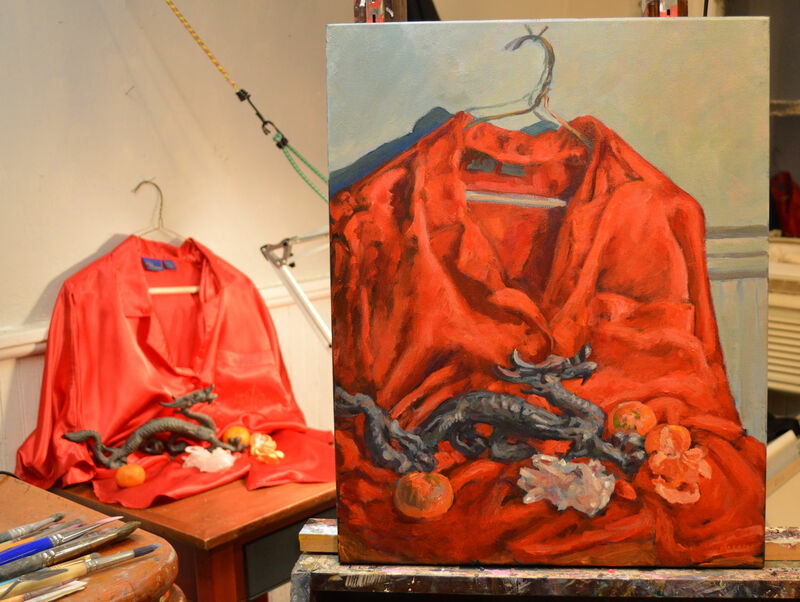 The still life arrangement is a little unusual but I’ve been wanting to work the red satin robe into a painting for quite some time. I love the way it glows. Red is the sign of strength and power. 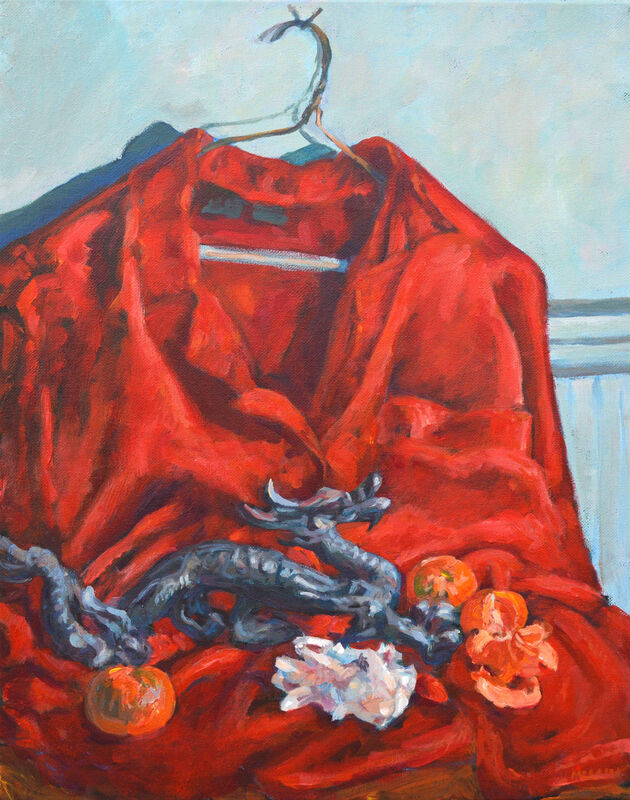 An unusual composition, the red satin robe brings all the elements together in this Lucky Red still life. I can’t recall where I acquired the black iron dragon but it usually guards my desk. Another symbol of strength and power, it can also represent danger. Hummm… The cluster of white/clear quartz crystals is a new acquisition from a neat rock shop that I visit sometimes. They’re all just so beautiful. This crystal is from the Arkansas quarry which apparently is in a vein of 170 miles long! Quartz is a very hard crystal and is supposed to amplify the powers of other crystals, especially healing. 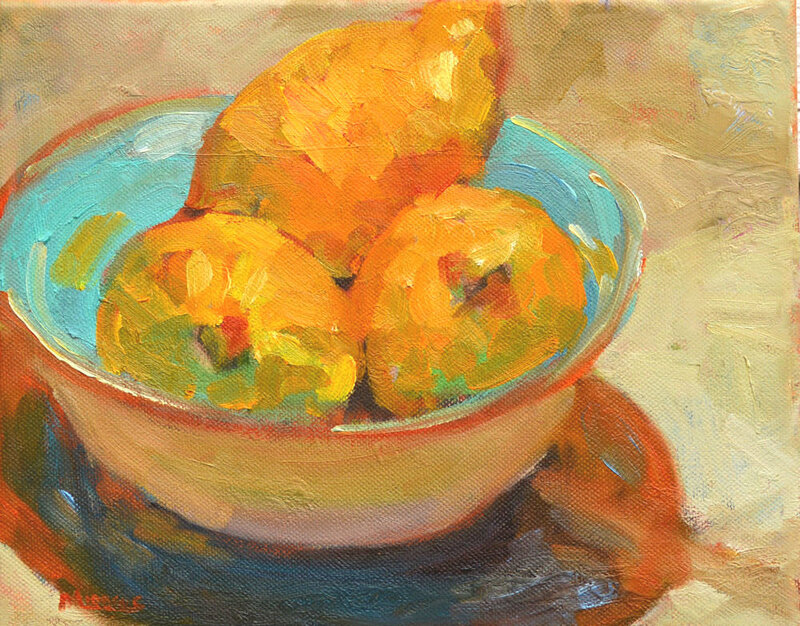 The mandarin oranges represent good fortune and the sun and are often given as gifts for the new year. I can’t vouch for the veracity of the good fortune that any of these items will bring, but I love to create still lifes that are a little beyond just pretty pictures. 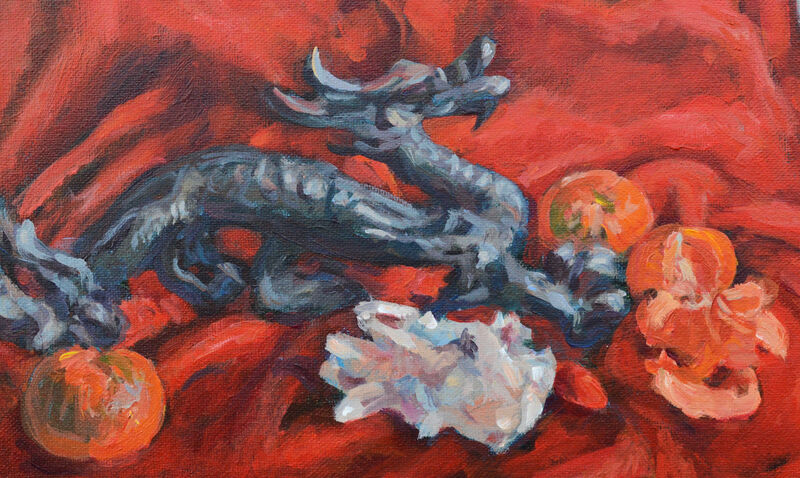 This series of Lucky Red still lifes all feature good luck symbols and the color red at least somewhere in the painting. 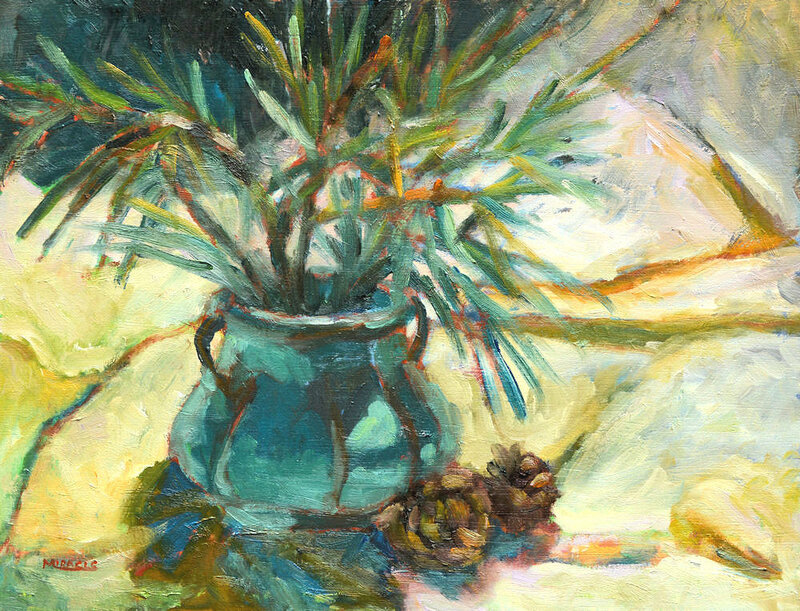 This painting is a vertical view, the first such arrangement in the series. 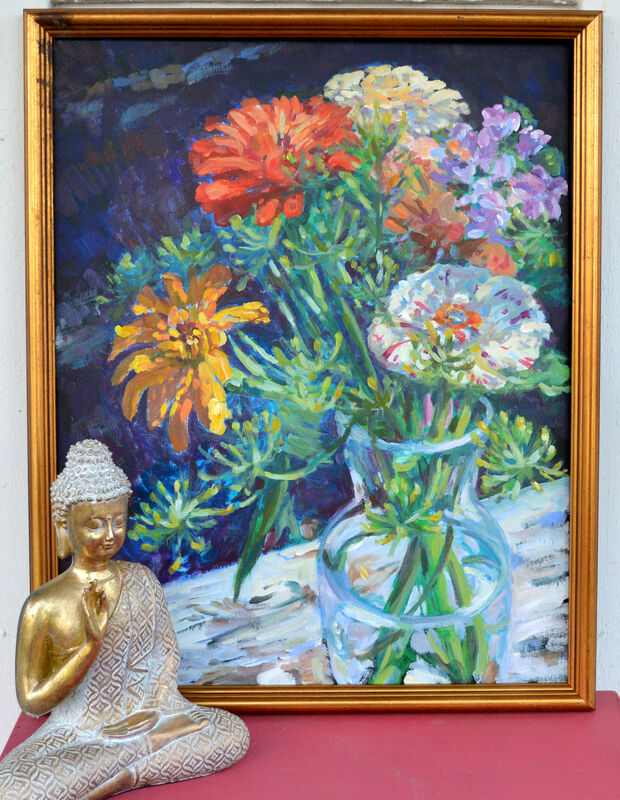 Painted in a contemporary impressionistic style, it brings peaceful contemplation to the viewer. Lucky Red #5 detail 2, showing the various shades of orangey-red in the robe. Very difficult to capture on the computer monitor. 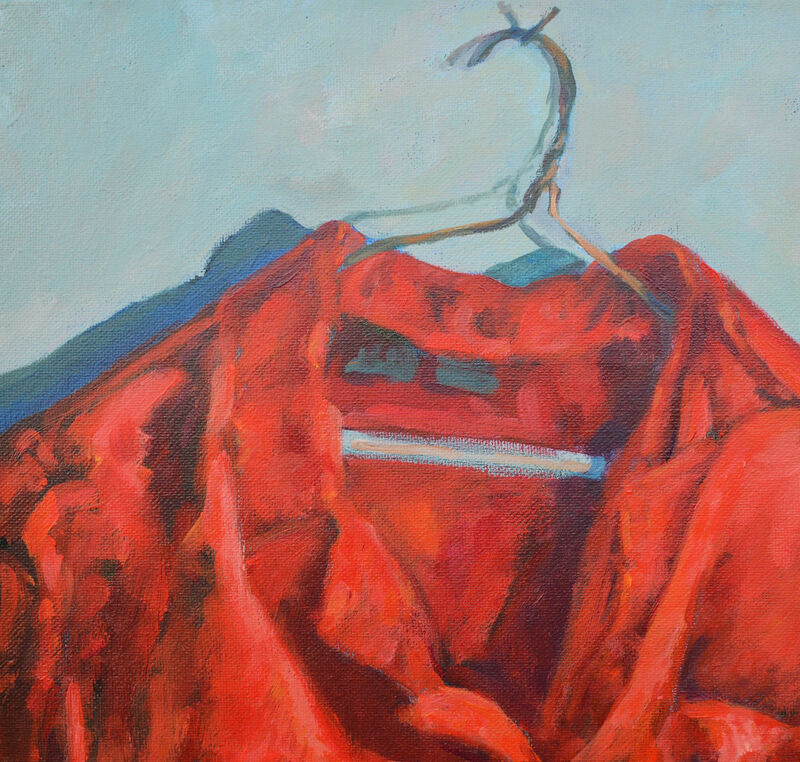 This is the fourth painting in my Lucky Red series. 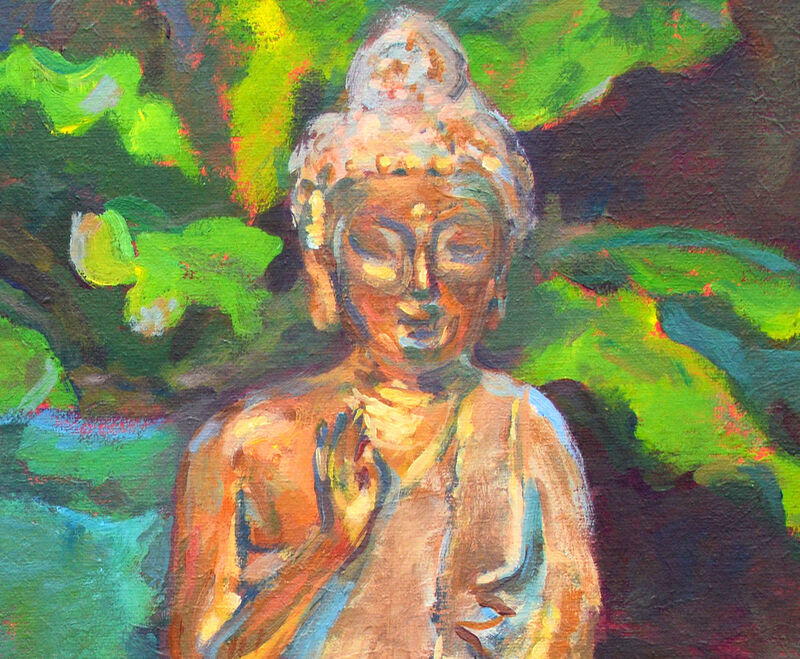 The sitting Buddha represents Vitarka Mudra or the teaching Buddha. The circle made in the right hand stands for never-ending flow of energy. 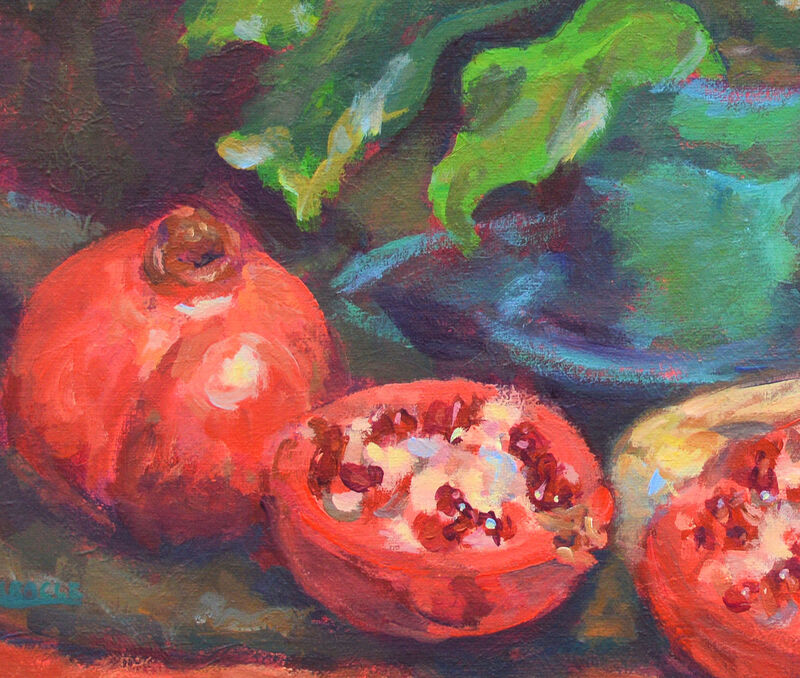 The pomegranates stand for fertility, abundance and marriage. 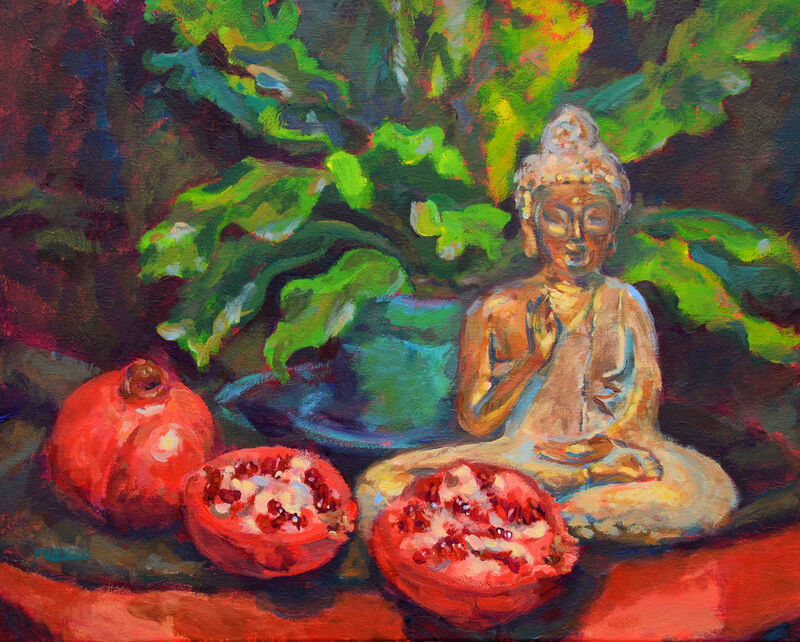 I like the slight smile on Buddha’s face along with the contrasting colors of the fruit and plant. 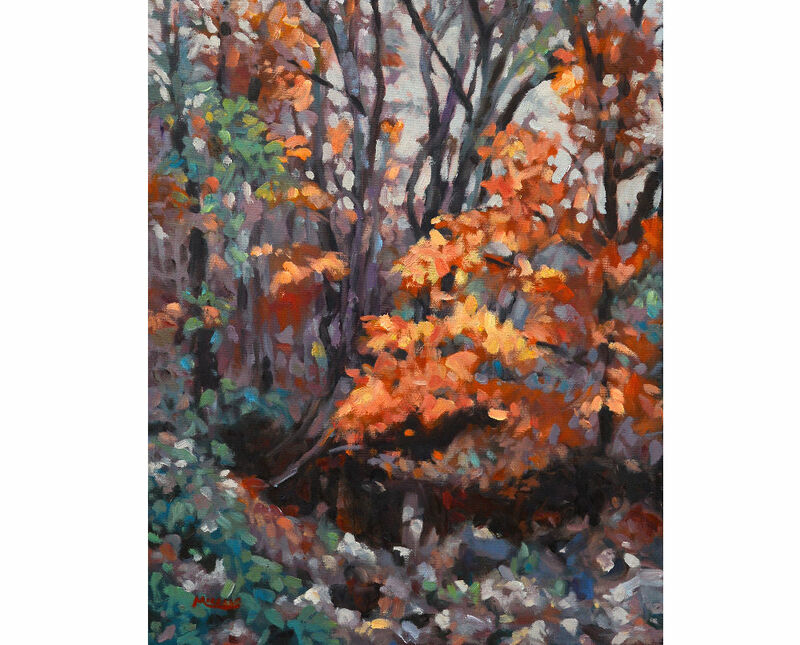 Painted in an impressionistic style, this painting brings a quiet, reflective mood to any setting. Yes, of course this is for sale. Click here. Jack Frost on my windowpane in the studio. After a balmy winter holiday, the temperatures in the Midwest plummeted. We recorded minus 4 degrees (F) this week. Needless to say, I’m a wuss and am not spending much time outdoors. However, even working in my studio has challenges. As I have mentioned before, my studio is an old summer kitchen about 30 feet from the back door. It was designed when cooking was done on wood-fired cook stoves (which it actually had when we moved here.) This was to keep the heat out of the house in the summer. You’ll find one of these buildings on many old farms in southern Indiana and throughout the Midwest and South. I am lucky that ours is about 15 x 25’, which is pretty large for a summer kitchen. In this case, the family and field hands actually ate in the building. It is a perfect size for a studio. Unfortunately, the whole purpose of the design was to keep the heat out of the house so they didn’t really care about insulating the building. Thus, it’s very drafty. Although I have a gas heater, unless I want to go broke, I keep it turned down. This week I was wearing a hat, many layers of clothing, two pairs of socks (the cold comes up through the floor), and I was still chilly. I snapped this photo of the beautiful patterns of the frost on the windowpanes. It looks like giant feathers. 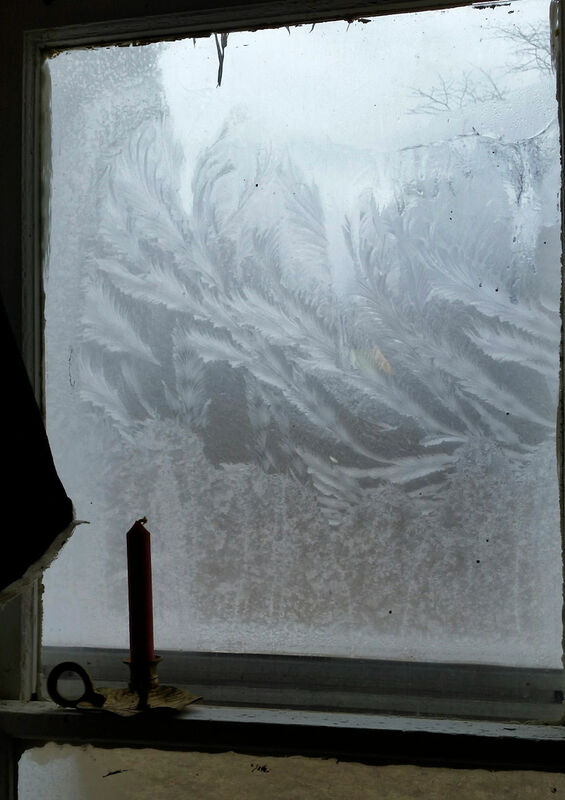 With all of our insulated windows and super-heated houses, window frost has become more and more uncommon. The beauty of nature is all around us, even in the most unlikely places. 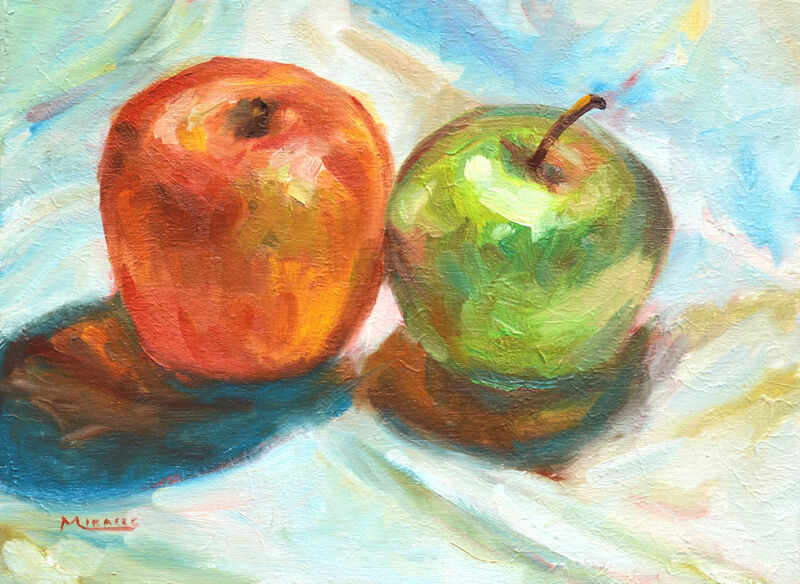 Since I was confined to studio painting, here are a couple of my recent works. 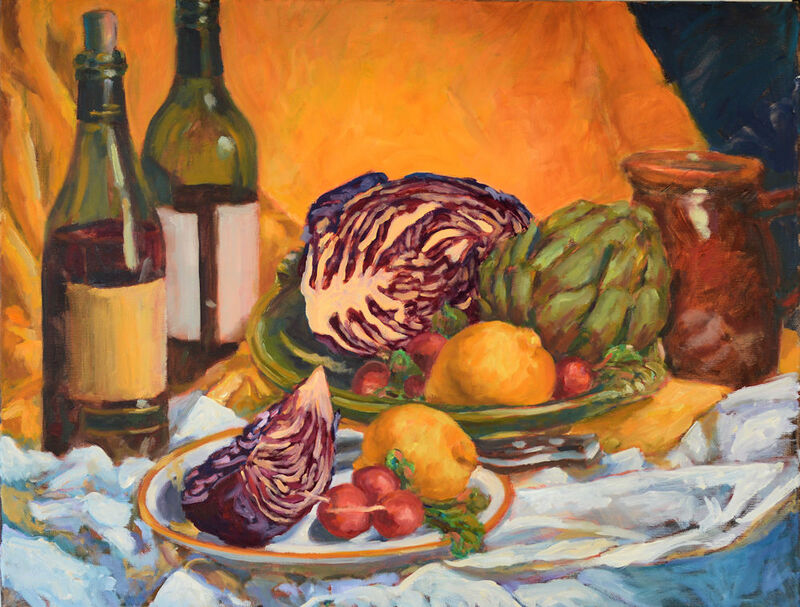 Plus, I tweaked the still life with red cabbage and artichokes that I posted on here a few weeks ago. Artists are never quite satisfied with their finished work. 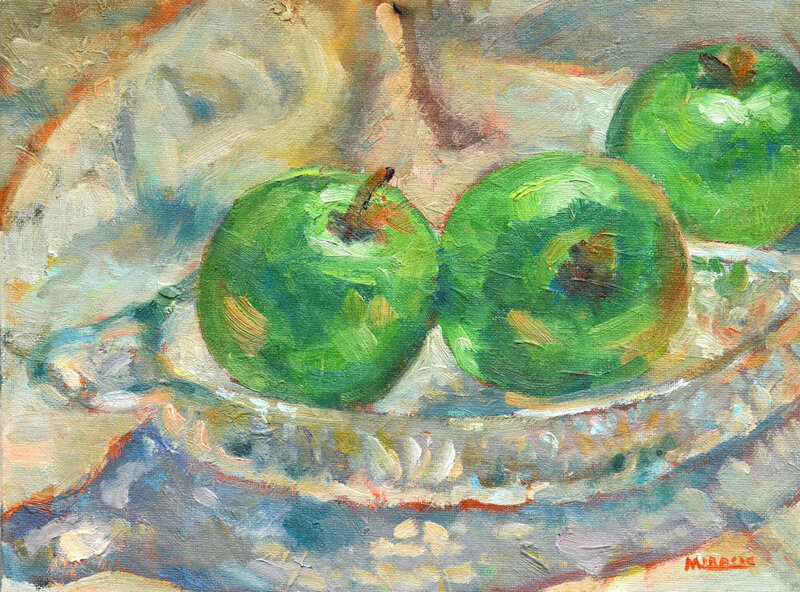 Renoir was known to bring his paints to gallery exhibits even after his paintings were hung, just so he could make changes. I’m not quite that bad but I might fiddle around with a painting which doesn’t quite suit me. Here’s hoping that the weather is better where you are and that warmer days will be here soon. 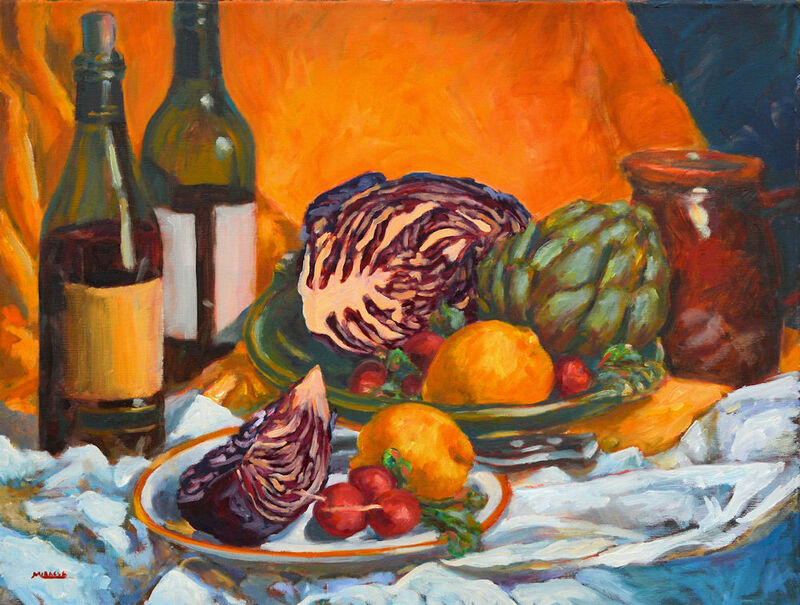 Red Cabbage and Artichoke, 18 x 24, oil on canvas, Kit Miracle. 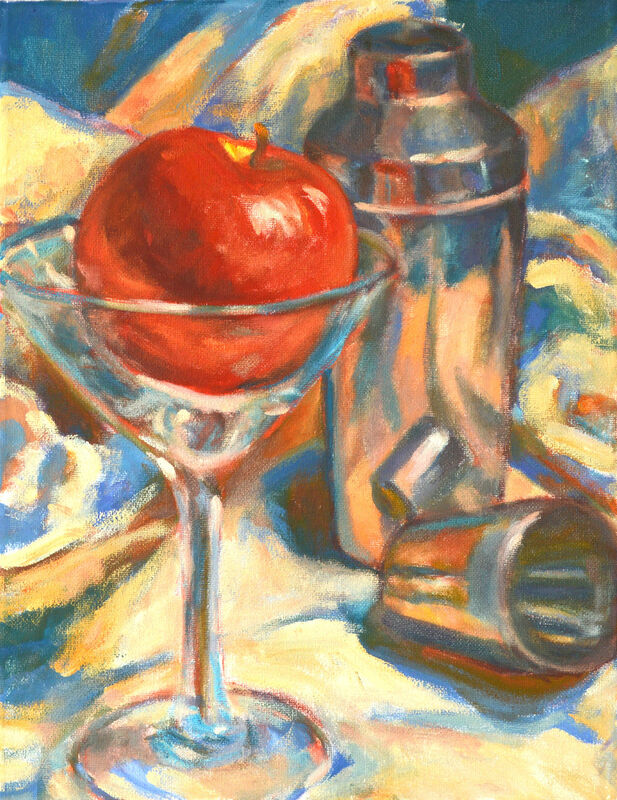 Still Life revised from previous version. 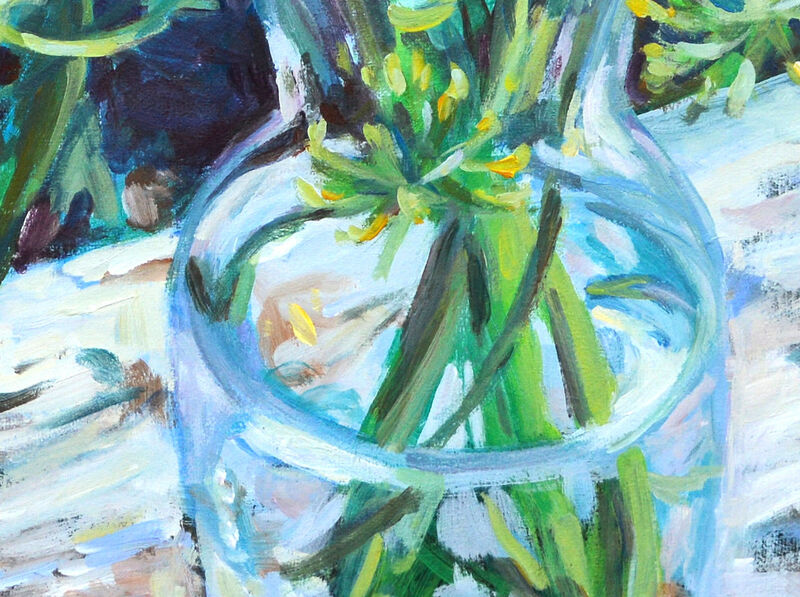 This still life is a little larger and more complex than many of my other recent paintings. I was inspired by a visit to the grocery. 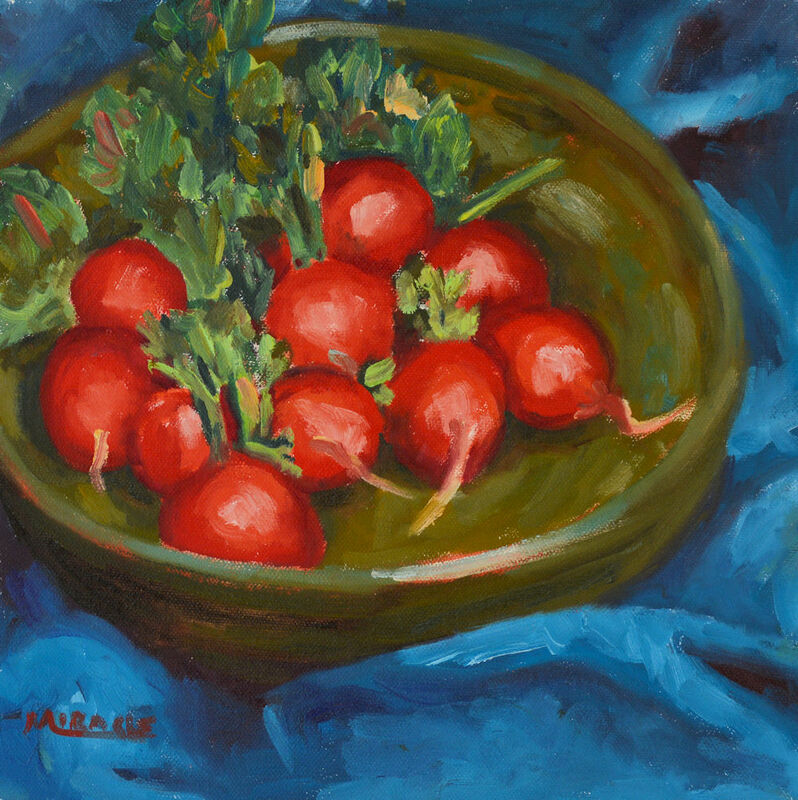 I must have had my “artist’s eyes” on that day because I seemed to be dazzled by the beautiful colors and shapes of the vegetables. Several of the more interesting vegetables came home with me that day. 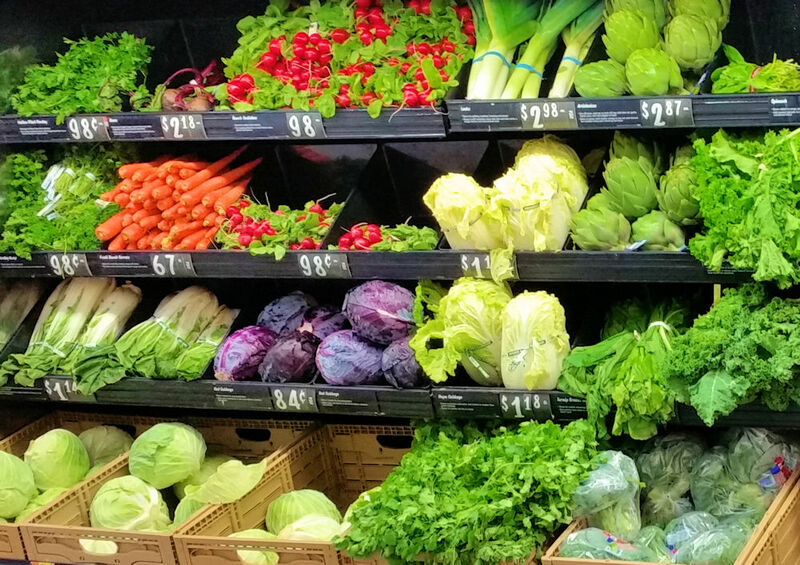 Inspiration in the vegetable department at the grocery. I love these colors and interesting shapes. 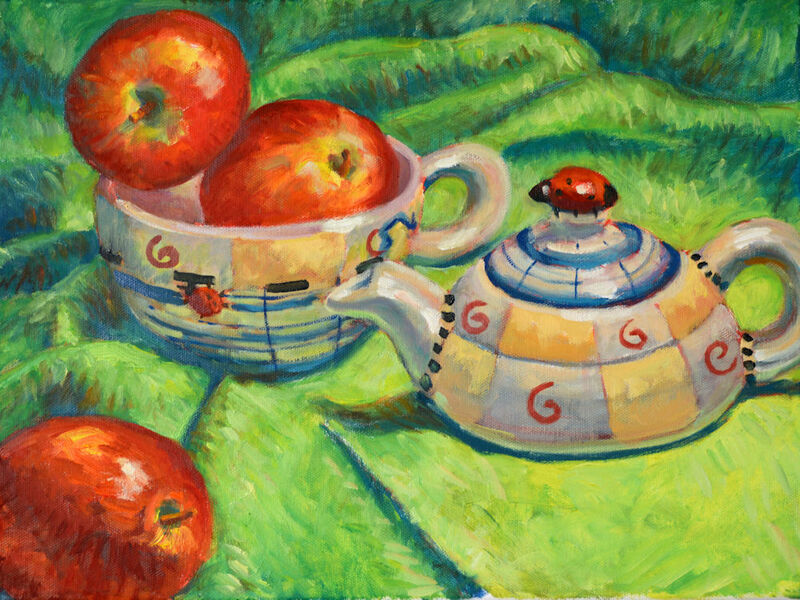 Before I tackled the main still life, I first completed several smaller still lifes just to get a feel for the shapes and colors. Surprisingly, the red cabbage was the most difficult to paint. It has very subtle hues of purple, red and magenta. It was a tight head so not much interest as far as shape until I peeled back a leaf or two. I think a larger, leafier cabbage would be far more interesting. 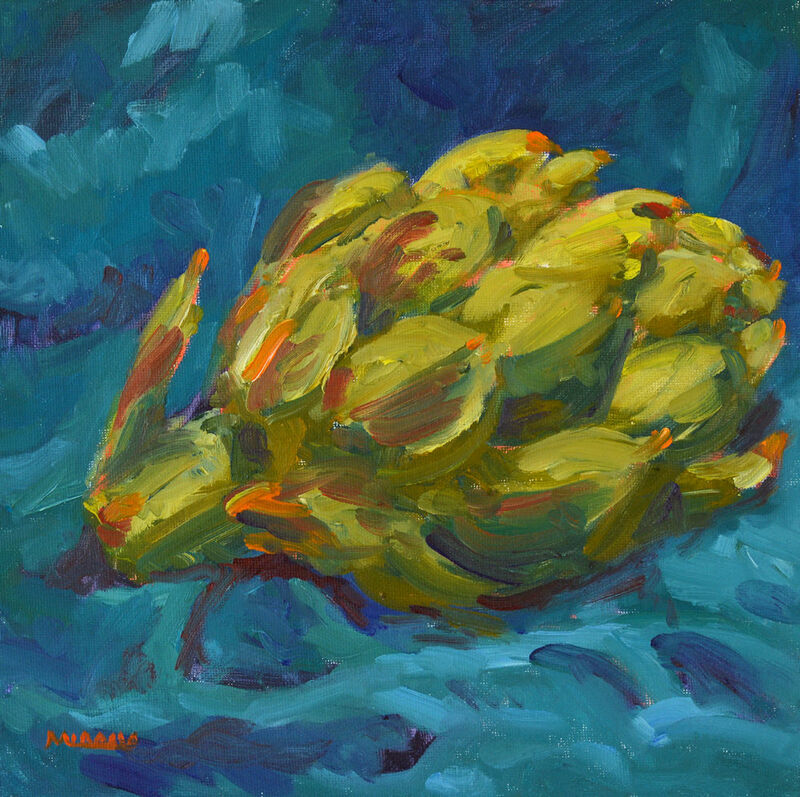 The artichoke, with it’s pointy leaves and shapes, was very fun to paint. The radishes are usually fun but their greens started to wilt quickly. However, they later generated more new leaves so that was a big help. 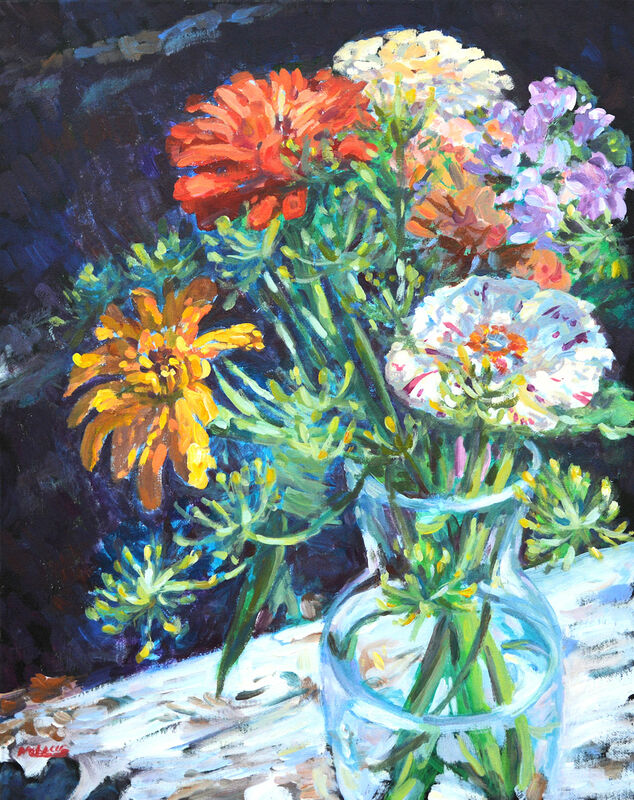 The final big still life was painted on an 18 x 24 inch canvas which I had toned in variegated colors. It seems to have a glow all its own. I don’t quite know how that happened except that some of the under painting showed through. Unfortunately, I didn’t’ take step-by-step photos of this painting. I might tweak it a bit more but there’s always a risk of going too far. Sometimes done is done. 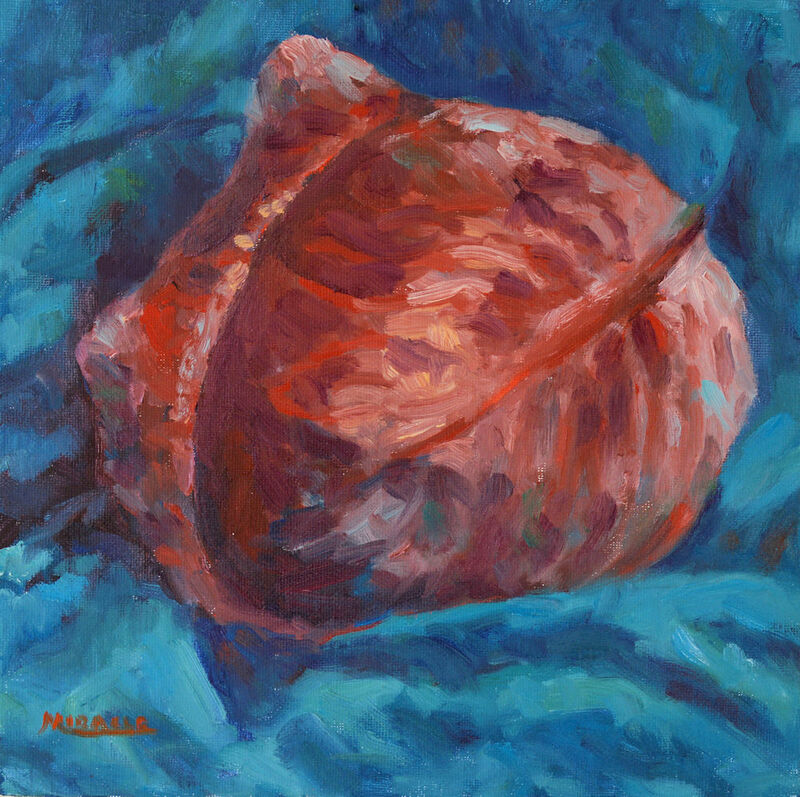 I’ve always liked red paintings. 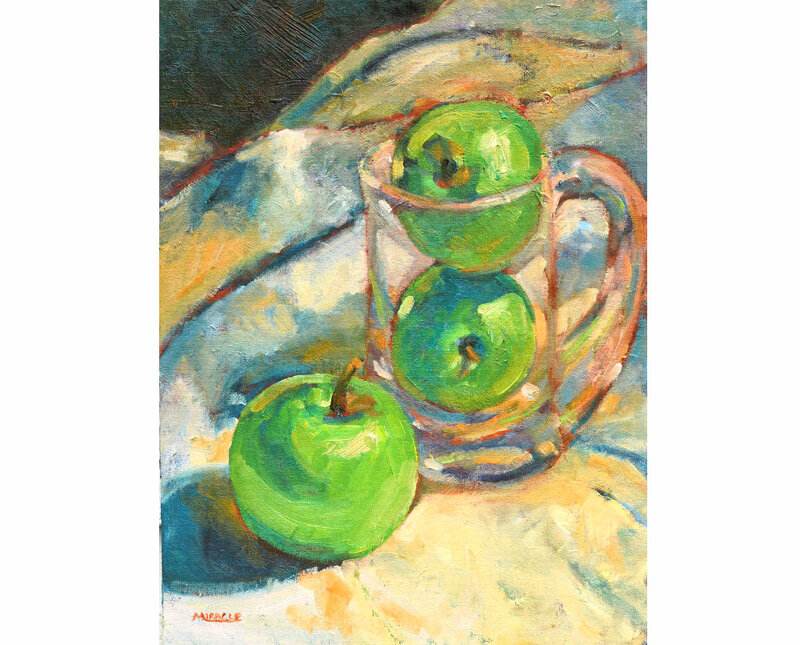 When I did art fairs for many years, they seemed to be very popular with my patrons, too. 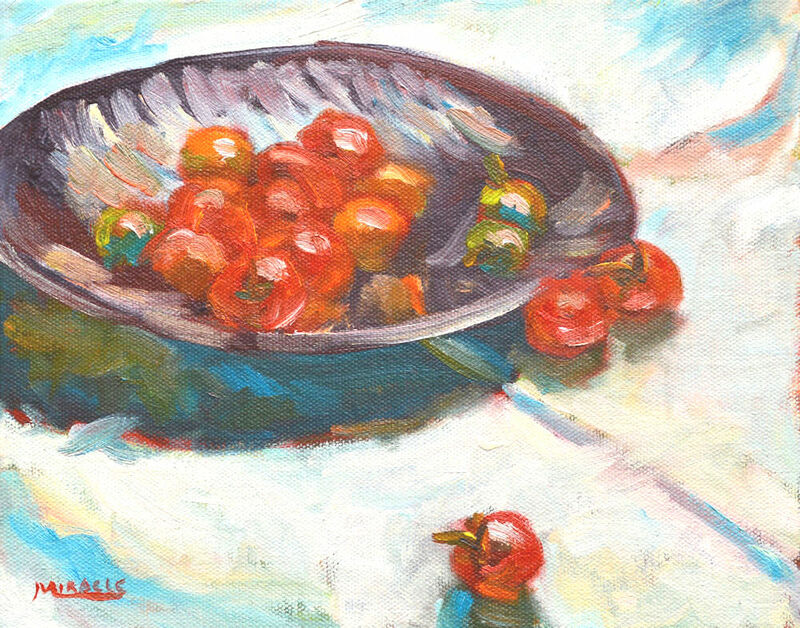 Everyone has room for a red painting to brighten up that special spot. 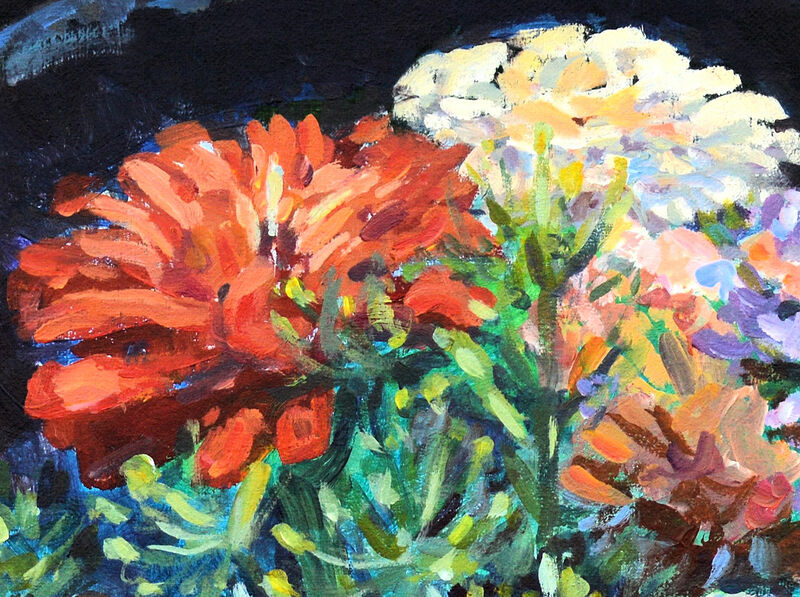 The four paintings that I completed this week are predominantly red or at least in the red/orange family. The first one, The Birdcage, features the antique birdcage that I bought at a flea market earlier this summer. I paired it with some bright red fabric printed with beautiful little birds. Then I decided to do a tea theme with a teacup and small teapot, along with some luscious lemons. Although the painting is a little busy, especially after the simplicity of the others that I’ve been working on lately, I think it works. 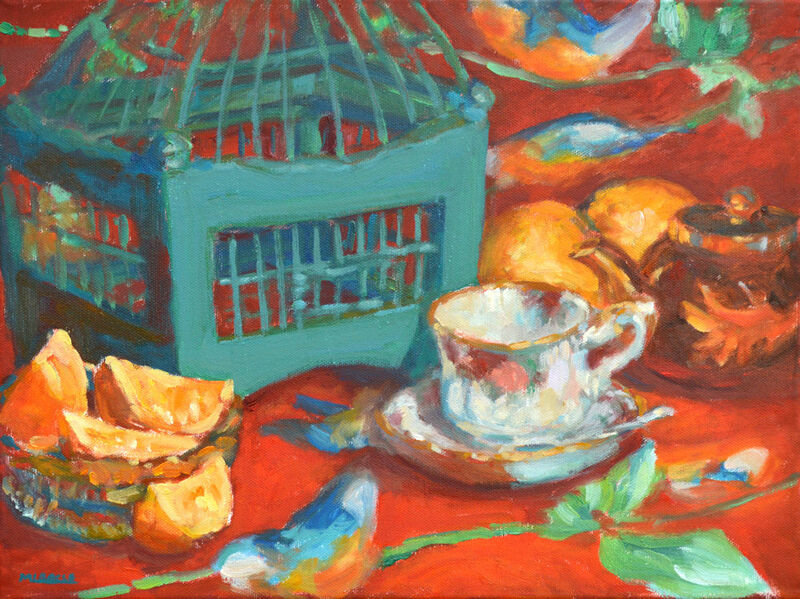 Boy, that birdcage was difficult to paint! The other challenge was to depict the birds on the fabric without letting them take over the composition. The second painting I did this week is called The Conversation. I can just imagine two friends having a lovely talk in the afternoon sunshine. It looks as if they just left, doesn’t it? 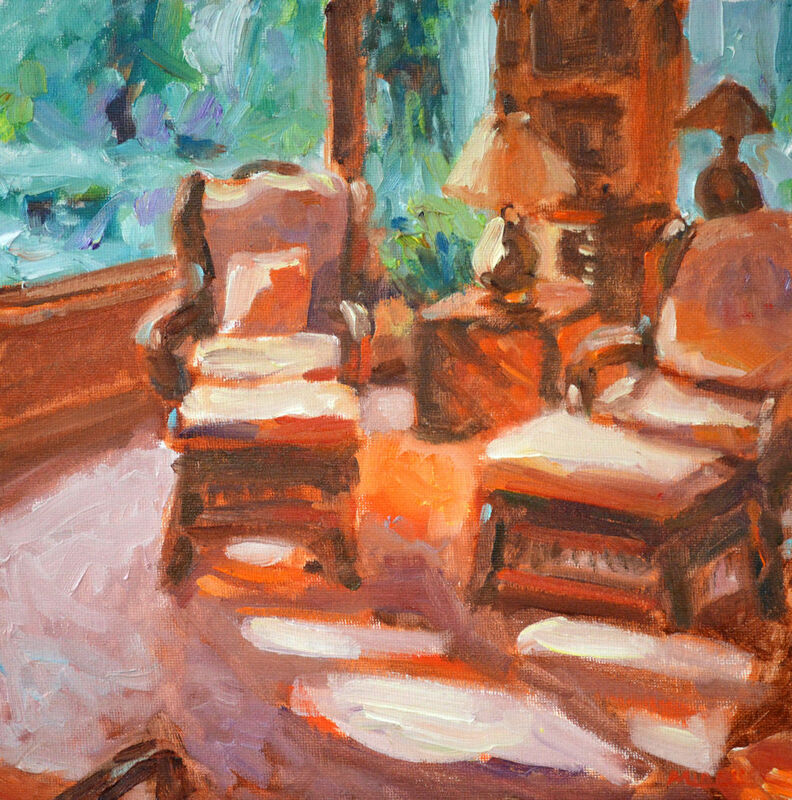 Then I painted this bright interior painting called Lamplight. 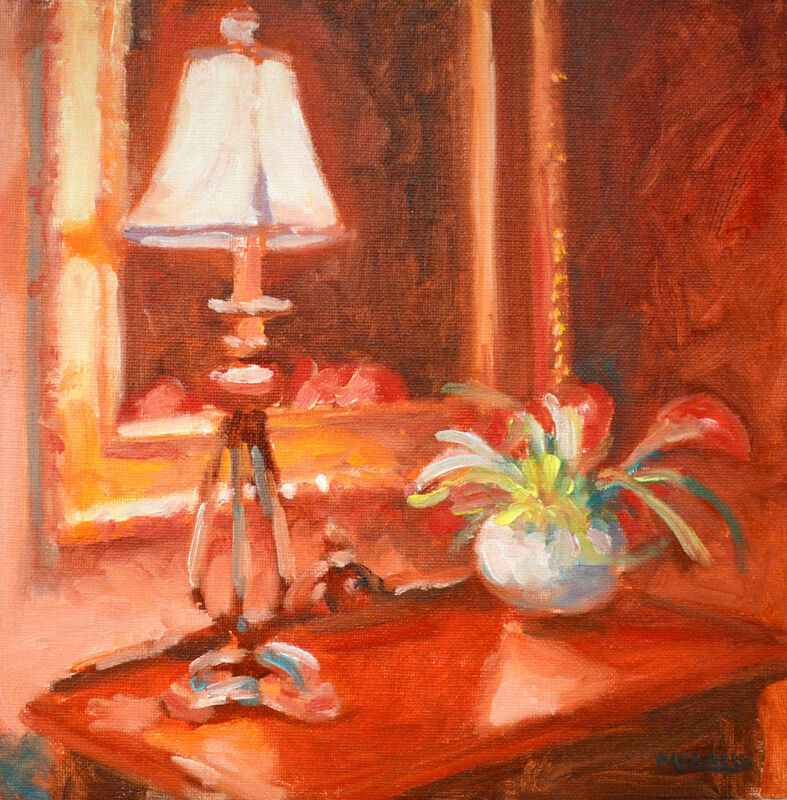 This depicts an interior scene, perhaps an entry hall, with a lamp and a simple bouquet of red flowers. The gold frame of the mirror helps connect the objects on the table. 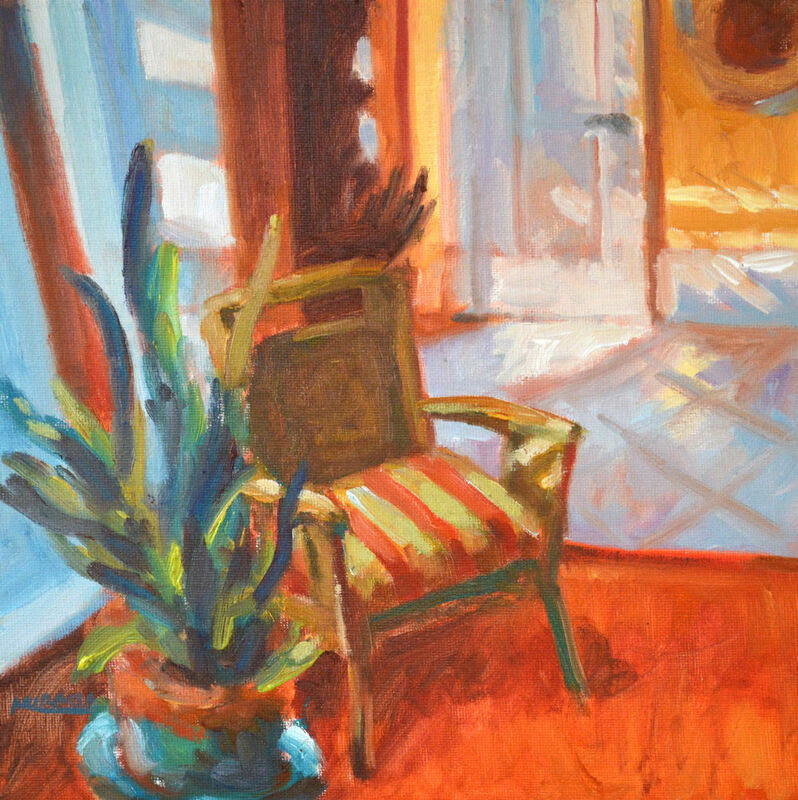 My final painting this week I call The Sunny Corner. I’ve always loved the play of sunlight and shadows on interior walls and floors. The effects are often fleeting but beautiful, nonetheless. The chair just invites the viewer to take a rest and enjoy the sunshine. 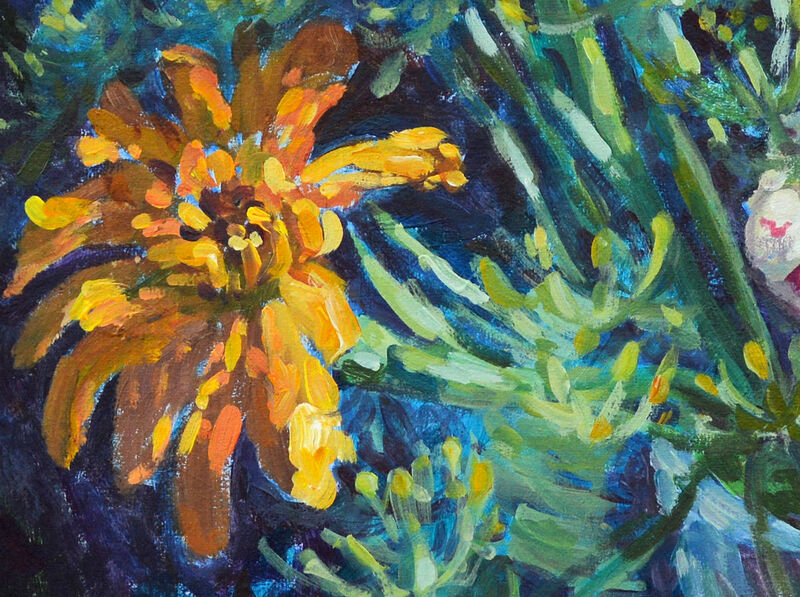 Visit my Etsy shop, KitMiracleArt, to see many more painting details. 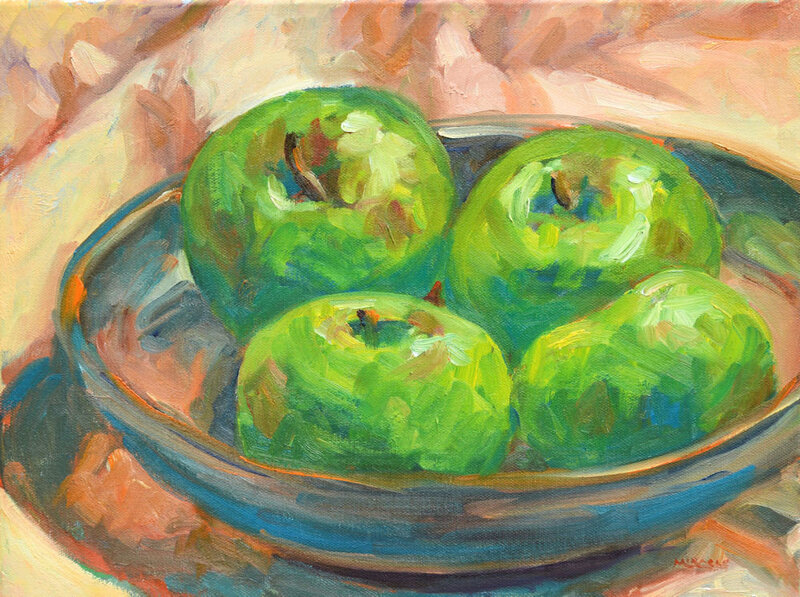 I’ve been painting a lot of still lifes lately. 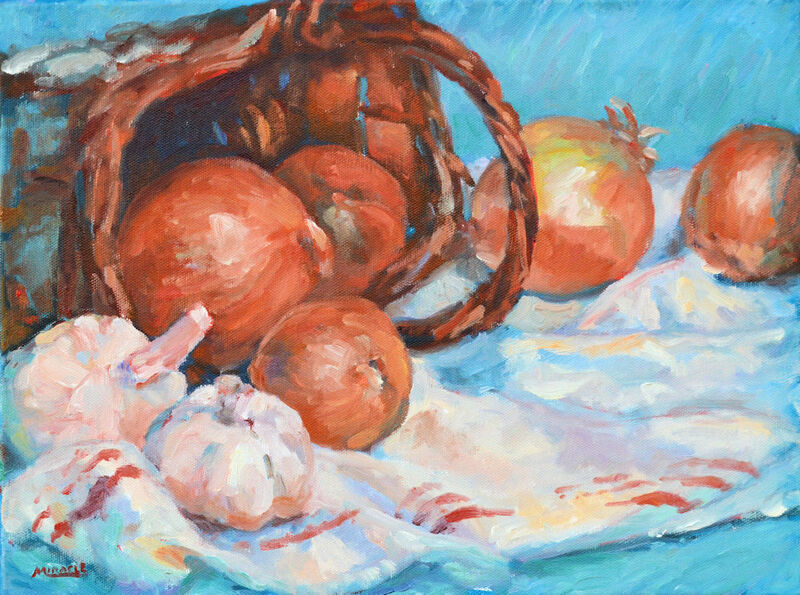 This one was inspired when my husband came home recently with a bag of big, beautiful garlic bulbs. I quickly grabbed them before he could put them in a sauce or plant them in the garden. Then I went “shopping” through the house and refrigerator, and even my prop closet for the rest of the items I needed for a still life. 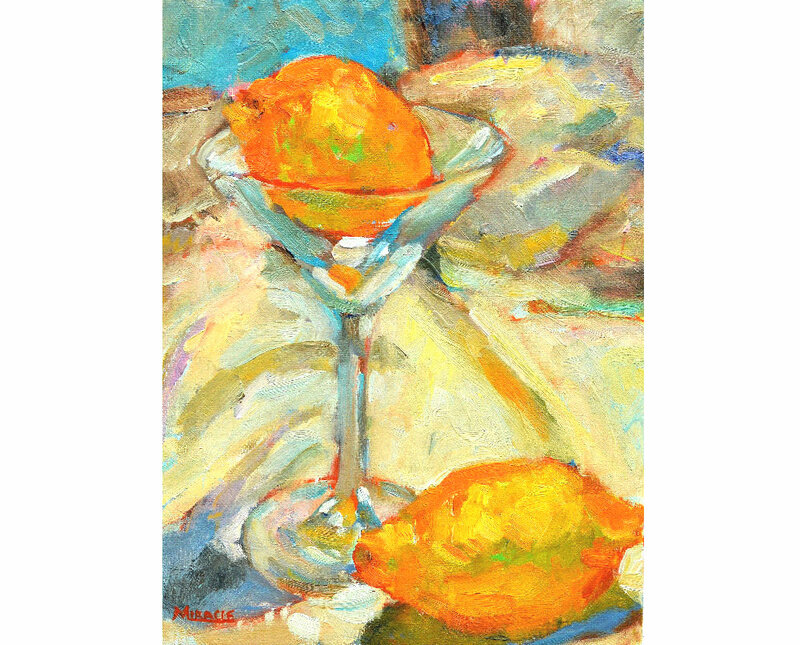 This one reminds me of something by Cezanne or Renoir. 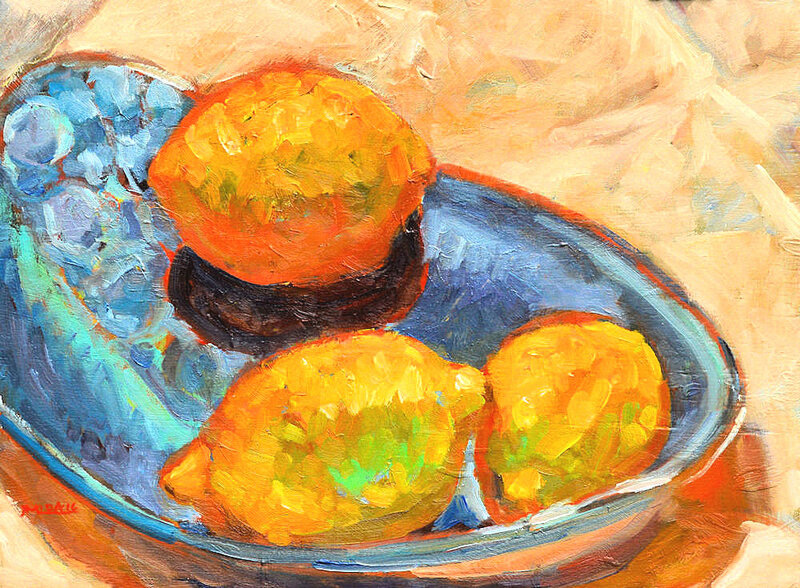 The impressionists were known for beautiful paintings featuring simple household items. 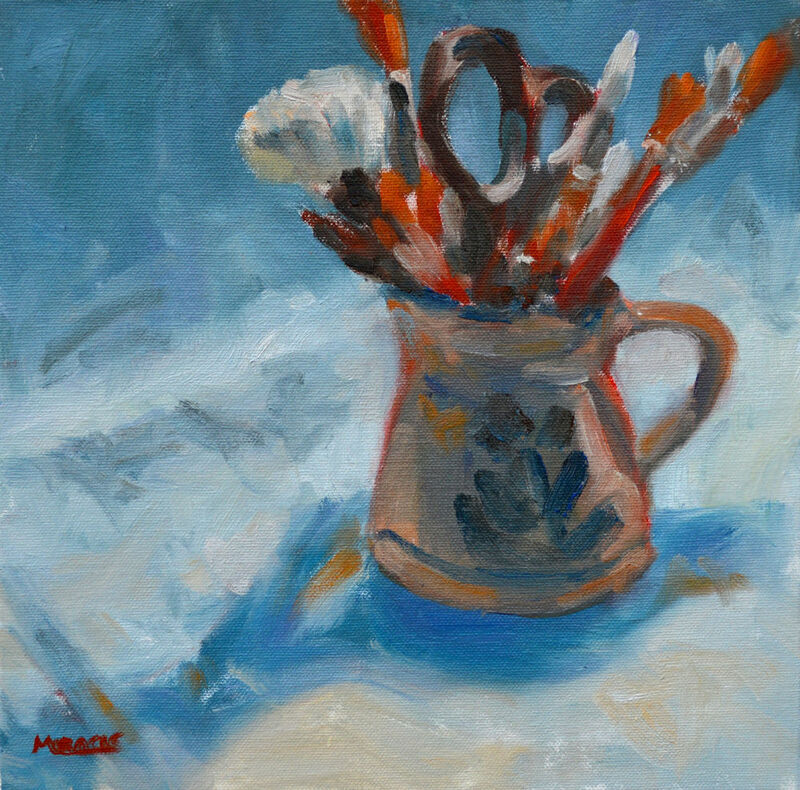 If you would like to see a demo of this painting step-by-step, click here for the demo page. The painting is for sale on my Etsy shop, KitMiracleArt. Paint has to dry though!